Working at an art reuse center, I see so many art supplies people may throw away get new life, from fabric scraps to pill bottles- people can turn ANYTHING into art. One thing that doesn't get much second time use? Glue sticks. These little plastic tubes sure are helpful for crafts with kids, but they aren't refillable like the bottles and they get used up (or dried out) so quickly. My first big piece of advice is that when you can use the bottles, do that. And if you are a mom or teacher, buy a big bulk bottle of glue and just refill your little ones. 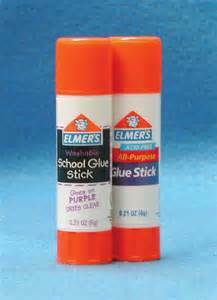 If you do use glue sticks (or are in the vicinity of any elementary school), DO NOT THROW THOSE GLUE STICKS AWAY. Elmer's glue (which is probably what you have, and if not, I suggest you start shopping there) accepts all of their glue sticks back in their Elmer's Glue Crew program. They primarily work with schools, so if you want to do EVEN MORE good (and really, who doesn't? You need good karma in case you need to key someone's car or steal cake from a baby or something), you could set up your local school or preschool for this program and stop all of those little plastic glue sticks from ending up in a landfill. You can read here for instructions- collect bottles and sticks from your local school or another program, and whenever you reach 250, send it on back to Elmer's. This is so simple, but how many people actually know about it? Get the word out, send your glue sticks back to Elmer's, and take yet another big chunk out of the plastic in our landfills and oceans. Thank you for choosing Newell Brands Office Products. We appreciate your interest in our products. Unfortunately, we no longer offer a recycling program for glue containers. We recommend reaching out to your local recycling program for possible assistance. Sorry for any inconvenience.